So I have definitely gotten behind on the updates of all the Korean-y goodness I found while on my trip there. I got busy–you know–watching a crap ton of Kdrama last month. Now that I’m back and am trying to get back on a regular schedule again, you’re in for a few more updates, including my interview with DramaFever. Today though? I thought I’d start from the beginning. My new favorite place, my Disney, Korea Town (or KTown for those in the know). 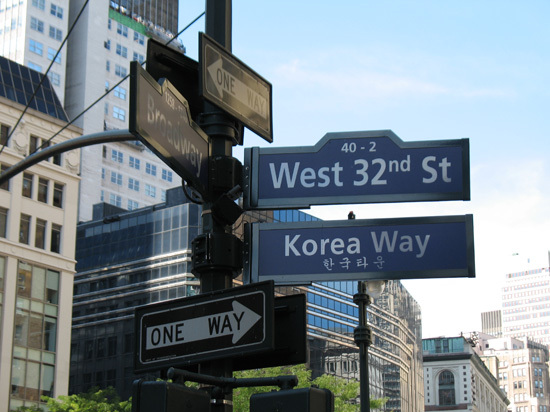 So Sayith Wikipedia: The heart of Koreatown is the segment of 32nd Street between Fifth Avenue and Broadway, officially nicknamed “Korea Way”. 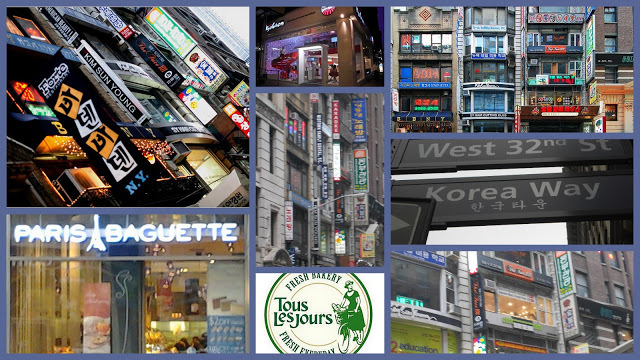 Though only one city block long, Korea Way features stores on multiple stories, with small, independently run establishments reaching up to the third or fourth floors, including restaurants, exuding an ambiance of Seoul itself. Now my hotel was strategically located almost right around the corner from KTown. And on this visit I’m not to embarrassed to say I spent the entire weekend (when I wasn’t screaming along to BigBang in New Jersey) on this block. I’d been to New York a few times, this time I was there just for a Korean related experience. Goal? Achieved. My boss actually goes to Ktown a few time a year as the textile market is held right nearby. While he was supportive of my enthusiasm, he warned me that I was building it up in my head to be cooler than it actually was. Really, it was just a book store and a bunch of restaurants. Obviously he was not looking at this from the eyes of a Kdrama fanatic. 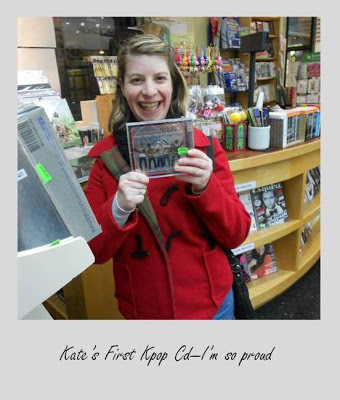 From the very moment I saw the sign, I was beyond thrilled. When I saw the streets lined high with Korean businesses, bustling with Korean people speaking actual Korean? Yeah, there wasa squealing–don’t worry, I kept it on the inside–I like to pretend I’m cool on trips. Yes there were a ‘bunch of restaurants’ but these were restaurants selling food I’d only seen before on TV. I live in the woods of New Hampshire, we don’t have any of this stuff here. 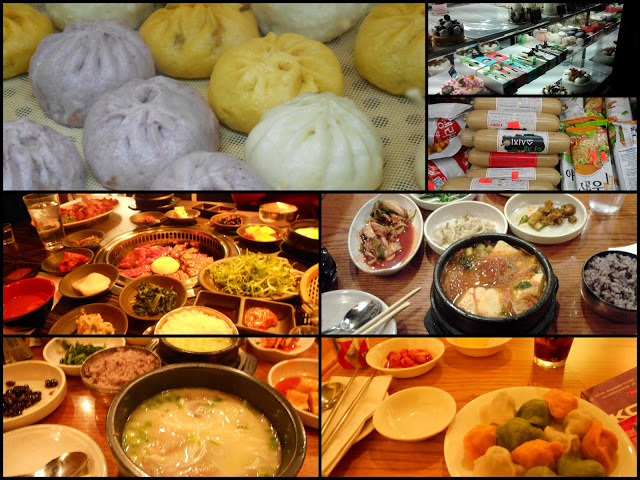 There was kimbap, bibimbap, steamed dumplings, dubuki, fried chicken, mandu, bubble tea, and Korean BBQ. The ‘bookstore’? Was awesome. Ask Kate, I spent hours in there. 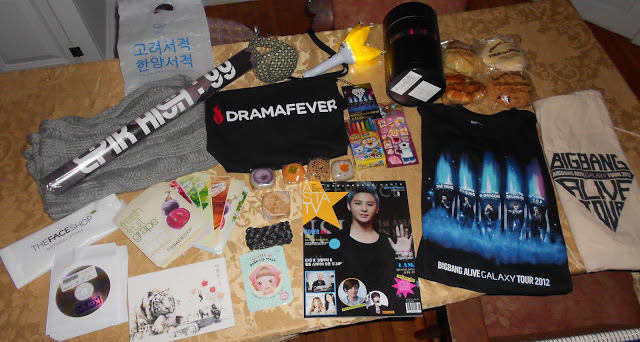 It had a selection of Kpop CD’s and schwag, it had Korean magazines, and Korean movies (I bought a bunch). They had both the gold and the bronze version of GD’s One of a Kind, (they were completely sold out after the BigBang concert), and they had Kpop and Kdrama fans! I talked to two teenage girls huddled around the BigBang selection. It ended up they were going to the concert themselves! I even tried my hand at flirting with the cute Korean guy working the video counter. Of course, my version of flirting is stammering while trying not to blush, so it’s pretty much imperceptible from my usual self. He was watching the World Within and told me it was good, he also liked Punch and The Man From Nowhere. When I wandered down the street, I looked over and who was looking at me? Kim Hyun Joong! Okay, it was a poster of Kim Hyun Joong, but even that made me do a little clap. 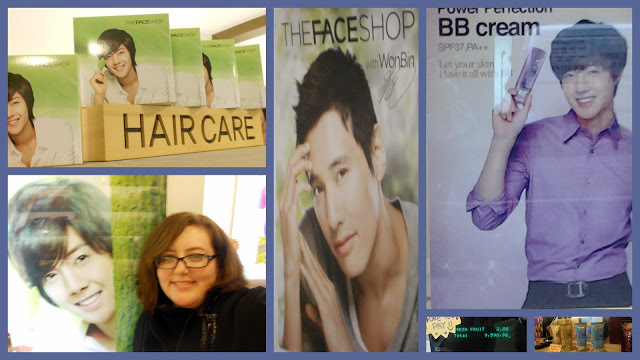 The Face Shopwas so much fun and filled to the brim with Kim Hyun Joong pictures. I saw BB Cream for the first time and I bought Korean face masks. Which are….interesting. When I checked out, the price was in Won! Come on. How amaz-balls is that? As I continued to wander down the street, something else had me stopping in my place. 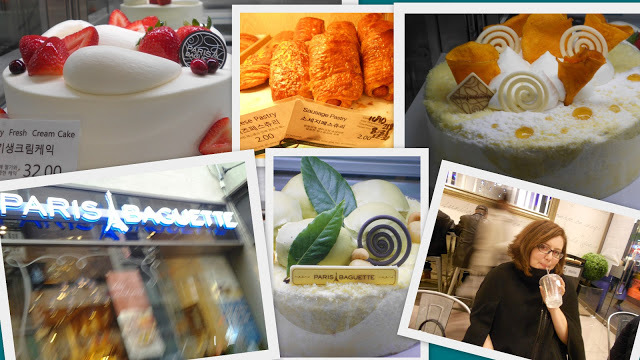 Paris Baguette! I know that chain! It sponsors tons of Kdramas and Simon and Martina from Eat Your Kimchi did a video there once, eating some weird pastry. I knew I had to go in. As a Kdrama fan wasn’t itmy responsibility to do so? It was filled with pretty cakes and indeed some weird hot dog filled pastries. Squee! Across the street there was also a Tour les Jour’s, where I drank bubble tea and bought pastries for my friends at home. Now, that one I didn’t recognize until I got home. A Gentleman’s Dignity featured it a few times and Dream High is almost a walking ad for the place. I learned I don’t care for black sesame, but I like the pumpkin donuts and rice cakes. Jami wouldn’t try the rice cakes as she thought the texture reminded her of eyeballs. As night came out and I circled the block for probably the 12th time, a video billboard that I hadn’t seen before caught my eye. And I freaked out. 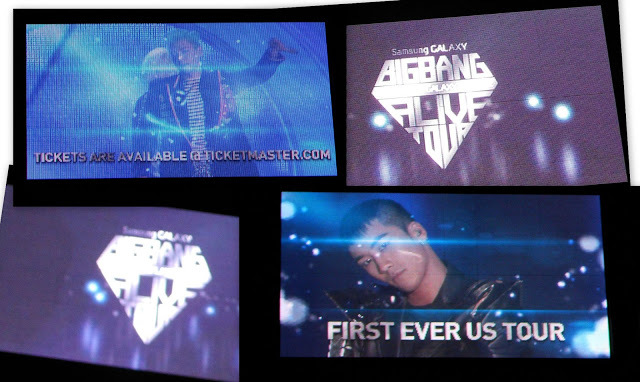 It was an actual commercial for the BigBang Alive concert! Played on a loop over and over and over again. How many times did I watch, transfixed at my biases dancing and singing their hearts out? Over the entire weekend? Um. That number I’ll keep to myself. Throughout the weekend I wandered in and out of accessory stores, into the book store, through cell phone shops, into grocery stores, into the book store, into coffee shops with Korean magazines laying around, into the book store, and ate my way through all of KTown (before hitting the bookstore again). There was just so much to see there, to experience. I’m sure I missed so much. I know I miss just being there. Just being that much closer to this society I’ve really come to love. Seeing the bustle of people around me, listening to the language, cheering whenever I caught a single word or phrase, just made me happy. Is this it you say? Well no. However, if I don’t stop now, one, my fingers will freeze, and two, it will be like 12 pages long. So we’ll stop here.